Gently steamed Wholegrain rice with peppers, sweetcorn and peas. 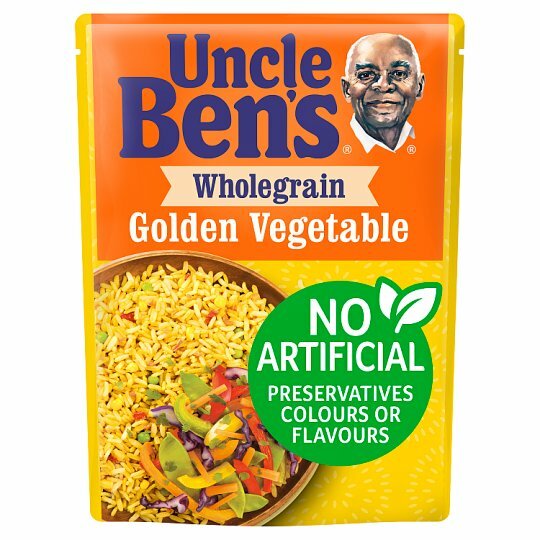 Our authentic Wholegrain Golden Vegetable Rice, with carefully selected peppers, sweetcorn and peas (and a bit of Uncle Ben's® know-how). Simply no need for artificial flavours, preservatives or colours. Why not try our Wholegrain Savoury Chicken Flavour Rice with chicken - for a tasty meal in no time. Freepost Mars Food UK Ltd.